OPI You Only Live Twice - Polish Etc. Today I have another gorgeous color from the OPI Skyfall collection to show you. 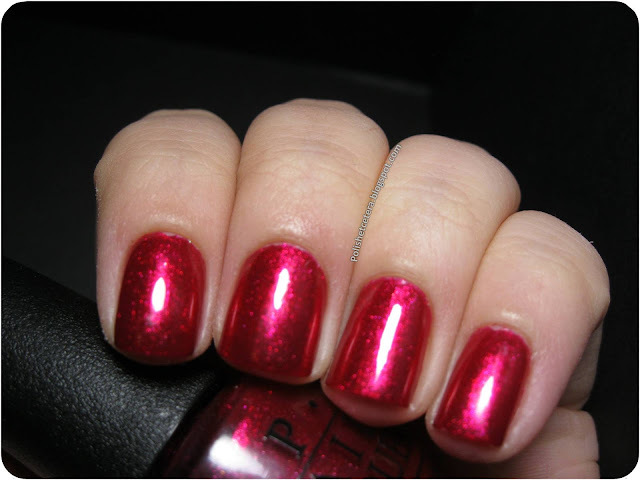 OPI You Only Live Twice is a beautiful raspberry-red with a glass fleck finish. The color sits nicely between red and pink, in some lights it looks very red while in most lights it has a strong pink-tone to it. Overall though I love it because it is incredibly sparkly. I love glass fleck finishes for their shiny jelly-like finish and the smooth sparkle that doesn't take any special top-coat. The formula is nice and pigmented, I could have used 2 coats on most nails but instead used 3 to add more depth and cover up any application mistakes (I had a few bald spots near the cuticle, which was probably more my fault than the formula's). Dry time is average, but I recommend waiting just a bit longer than usual to prevent any pulling near the cuticle. OPI is one of my favorite brands because they wear well and don't chip on me, so please excuse any wear in the photographs as this is after three days of wear. I didn't realize it looked so bad until I was watermarking the pictures! I just love how beautiful this color is. You Only Live Twice is one I'll be wearing all year long as both manis and pedis. Also, this polish is a bit more special since it was a gift from my sister, and any day my family indulges my 'addiction' is a good day!